The floating docks at Heaving Down Rock Marina. Aerial of Heaving Down Rock Marina. 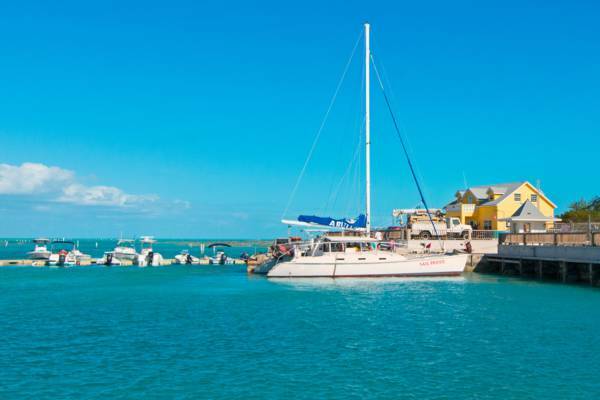 Located on eastern coast of Providenciales, Heaving Down Rock Marina, (also known as Walkin Marina) functions a departing port for small passenger ferries, and as a home for both tour boats and private vessels. The two passenger ferries services, Caribbean Cruisin' and MV My Girl, leave from the general vicinity. These ferries are commonly used when taking a day trip from Providenciales. Caribbean Cruisin’ operates inside the marina, with an established office and waiting area. MV My Girl simply docks outside the marina, basically at the unpaved turn-around where Leeward Highway concludes at the ocean. It’s possible to unload a vehicle quite close to where the ferries depart, and doing so is advisable when travelling with large amounts of luggage. There is ramped access to the boats. There is no charge for parking either inside or outside the marina. Please consider your chosen parking spot, especially in the turnaround outside the marina, as cargo barges do occasionally dock in the area. Heaving Down Rock Marina is found near the eastern conclusion of Leeward Highway. Simply drive east on the highway and you’ll eventually arrive at the site. It’s about three miles (4.8 km) from the Seven Stars Roundabout near Grace Bay (where Leeward Highway constricts from a four lane dual carriageway to a two lane road). If in the Leeward residential region of Providenciales, simply take a left out of the southern entrance gates. The marina is a short .4 mile (.6 km) drive away. When you’re close to the marina, on your right you’ll pass the Caicos Conch Farm and directly before the entrance of the marina, the rusted remains of a white M35 "Deuce and a Half" former military cargo truck. Boats moored at Heaving Down Rock Marina, Providenciales. 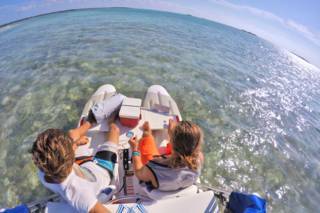 High Wave Tours offers guided boat rentals and tours to the incredible beaches and sights around Providenciales. 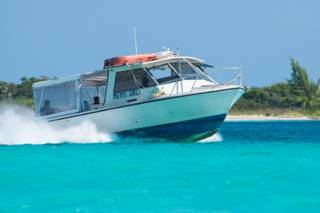 Pilot your own two seater mini catamaran on custom excursions to beautiful beaches, the iguana sanctuary of Little Water Cay, Half Moon Bay lagoon, the La Famille Express shipwreck, and more! 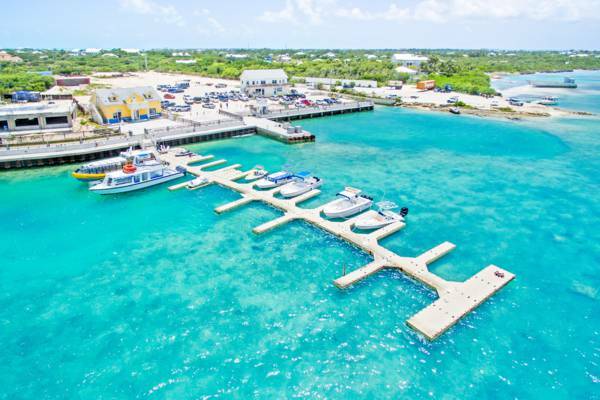 Located at Heaving Down rock Marina on the east end of Providenciales, Caribbean Cruisin' is the main ferry service operator in the country, with routes to between Providenciales and North Caicos, and Providenciales and South Caicos. Jet ski rentals and organized tours and excursions are also offered. 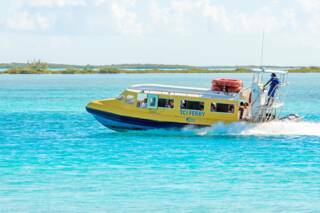 This ferry service travels between Heaving Down Rock on Providenciales and Bellefield Landing on North Caicos. We recommend calling ahead to verify the schedule. Operating in the Turks and Caicos for over twenty years, Sail Provo offers unique adventures on a 52 foot catamaran sailboat. There’s a wide selection of excursions to choose from, with half and full day secluded beach and iguana trips, dedicated snorkelling safaris, and sunset and glow worm cruises. Last reviewed by an editor on 26 July 2018.